Lead generation is one of the most important aspects of any business. If you aren’t generating leads, you’re not growing your customer base. But just as important as generating leads is turning them into sales. According to Marketo, 96% of visitors to your website aren’t ready to become customers yet. The process of capturing leads, finding the best ones and turning them into sales is called your lead generation funnel. If your lead generation funnel isn’t performing as well as you’d like, here are a few things you can do to improve. For starters, it’s important that everyone within your business is on the same page in regards to leads. What this means is that the Marketing Department, Sales Department, and Management should all agree on exactly what type of leads you’re looking for and the best ways to go about getting them. You don’t want your Marketing Department tailoring the business’s message towards one group of people only to find out that your Sales Development team is prioritizing other groups. Take some time to get the heads of these departments together and map out a plan. If the plan changes anywhere along the way, it’s important that everyone who is working on the lead generation funnel is aware of it. Getting everyone on the same page is essential for the other tips mentioned below, so make sure you do this first. One problem that many businesses face is they develop tunnel vision towards one or two lead generation strategies when there are many other options out there. According to Direct Marketing News “The three most commonly used B2B lead generation strategies are email marketing (78%), event marketing (73%), and content marketing (67%)”, but there are many others. If your business is only sticking to the most popular options, you could be missing out on a lot of potential leads. It’s important to expand your horizons every once in a while and see if there’s a new lead generation strategy you can try. For example, let’s say you’re primarily focused on bringing in leads through search engines. While optimizing your website for these search engines can certainly bring in plenty of visitors, adding an Inbound Marketing strategy to the mix could exponentially increase your results. Another option is to simply let someone else handle your lead generation for you. Outsourcing lead generation is a great way to take something off your own plate and allow an expert team to handle it for you. This ensures that you not only get great results, but it can even save you money by having a smaller team. Having a great lead generation funnel doesn’t help much if there aren’t that many leads coming in. By exploring other possibilities you may find a lead generation strategy that works even better than what you currently have. Once you have plenty of leads coming in, you need to figure out which ones are worth your time. To do this you’ll want to implement lead scoring. 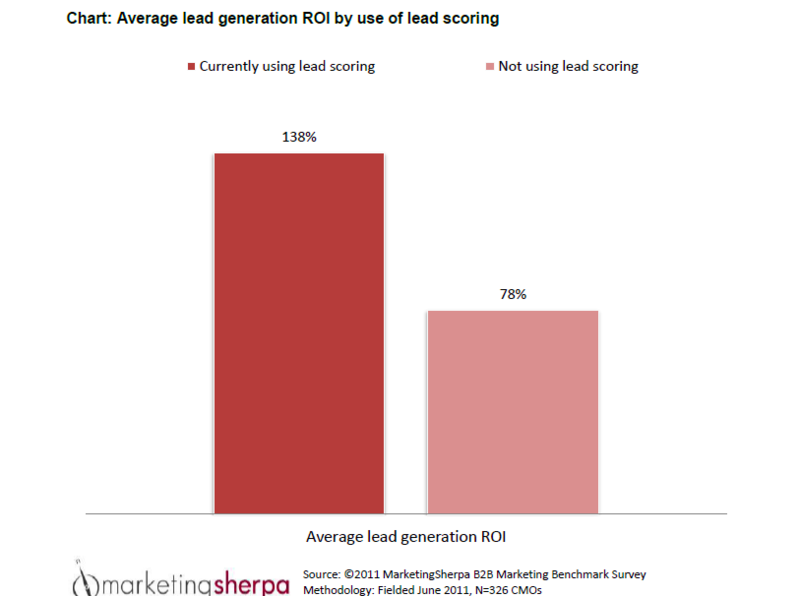 Lead scoring is when you assign a numerical value to each of your leads to represent how strong it is. This numerical value comes from analyzing lead information and behavior, then giving each data point a certain weight. For example, if someone visits your website and spends a few minutes on one of your product pages, you might rate this lead higher than someone who only visited your page for a few seconds. Or, if you’re selling a product that benefits large companies, the owner of a startup would rank lower than a big CEO. Each business will have its own criteria for what constitutes a strong lead. The important thing is that you come up with a formula so that you’re able to impartially rate each lead, rather than just going by gut feeling or guessing. Once you’ve figured out which of your leads are the strongest, you need to nurture them. Not every lead will be ready to buy the second they hear about your product or service. Instead, you need to slowly guide them through your sales funnel. Let’s say your business puts out a free newsletter each month. Just because someone signs up for it doesn’t mean they want to become a customer. However, it does mean they are interested in what you have to say. So, you might have an easier time convincing this person to become a customer. To nurture this lead, you might mention the benefits of your product in your newsletter. Or, after sending them a few great copies of your newsletter each month, you send out a separate email pitching a free trial on your newest service. Nurturing your lead means not bombarding them with sales pitches the second they show interest. Rather, demonstrate some value, then work on inching them closer towards becoming a customer. Doing all the above will prove difficult if you don’t have the right tools to help you out. To improve your lead generation funnel, there are a few essential tools that you’ll want to get. A Customer Relationship Management Tool – A CRM is a must have for any business. With it you can keep track of all your customers and leads, including how far along they are in your lead generation funnel. With a good CRM you can reach out to the right leads at exactly the right time for the most impact. Marketing Automation Tools – Next, you’ll have a lot of marketing tasks on your hand, so you’ll want to automate as many of them as you can. For instance, if you’re running a drip campaign, you don’t want to be responsible for remembering to send out each email at the right time. Find an outreach automation tool that helps you to do this automatically and save yourself the stress. A Communication Tool – Finally, you need an effective way for your team members to communicate. As we said above, it’s essential that everyone remains on the same page. Look for apps like Slack to help keep everyone in touch so that everyone is heading in the right direction. Finally, to improve your lead generation funnel, you need to track your current efforts and analyze the results. There is no one correct solution that will fit all businesses. The lead generation funnel that works for you likely won’t work for someone else. For example, let’s say you’re generating plenty of leads, but they aren’t converting into sales. In this case, you may have an issue with how you’re rating your leads, or perhaps there’s an issue with your sales staff and their ability to close the deal. The only way you’ll know for sure is to analyze your performance and try out new strategies. Having a strong lead generation funnel is one of the best things any business can do for itself. But developing this funnel takes time and effort. Start now by talking to your team about what sort of leads you’re after, then start looking into different lead generation strategies and how to nurture them. If you keep at it, and always look for ways to do better, it won’t be long before you have a lead generation funnel that benefits you for a long time to come.